People opposed to the government exchanged gunfire with police in the Republic of Congo capital of Brazzaville Monday. A police station and a government building were attacked in the Makelekele district of the city, according to the BBC. Violence also occurred in the Bacongo neighborhood of Brazzaville. The Associated Press reported that police battled militia fighters. 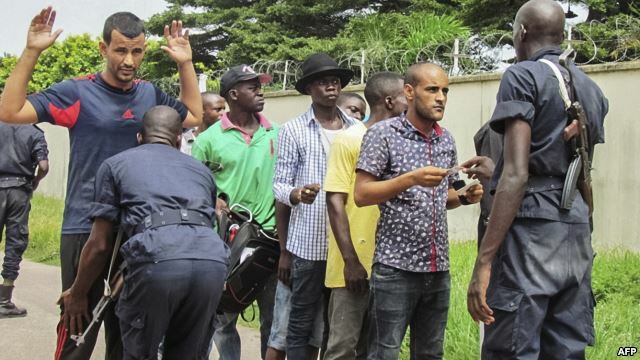 Reuters news agency said that young, male Congolese who oppose President Denis Sassou Nguesso battled police. There are no reports of injuries or deaths from Monday's shootings. A government official told the Associated Press the militia are known as the Ninjas. They take their name from an anti-government group in the 1998-1999 civil war. The violence comes a month after Nguesso won re-election. Some accused him of "massive fraud" in the 2016 election. He ruled the Republic of Congo from 1979 to 1992. He won disputed elections in 2002 and 2009. What they said is totally opposed to facts. The thief was seized and turned over to a police station. A year later, coalition and Iraqi forces have killed or captured hundreds of militia fighters. We must try to counteract the present current of anti-government feeling. 1.A police station and a government building were attacked in the Makelekele district of the city, according to the BBC. Violence also occurred in the Bacongo neighborhood of Brazzaville. Prices see-saw according to demand. 2.Some accused him of "massive fraud" in the 2016 election. Jack was accused of being a spy. He is accused of being indiscriminately optimistic and formless. spyn. 间谍，侦探，侦察 vt. 侦探，看到，找出 vi.